A fig leaf and lime candle has a natural scent that is slightly sweet with a little tartness to it. The smell is somewhat masculine, and has a rich, heady element to it that makes it perfect for fall and winter. A candle scented with fig leaf and lime can be a tough thing to find. While this scent combination has been popular for some time in bath products and even reed diffusers, candles don't seem to be part of any popular product line. Fortunately, the oils you'll need to create your own candles with this scent are readily available, and you can customize the fragrance blend to suit your own personal tastes. Both lime and fig leaf scents are available as essential oils and man-made fragrance oils. For blending purposes, it's best to combine similar types for stable results. 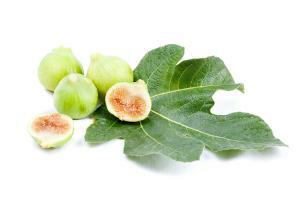 Fig leaf essential oil can be dangerous, causing skin irritations and other, more serious conditions. Because of this, fig leaf scented fragrance oils are much safer for candle making. Fragrance oils are often blends themselves, and their names can be confusing. For candle making blends like this one, look for something called Osmanthus and Fig Leaf. This is a blend of fig leaf and a Chinese blossom called Osmanthus that deepens the fig leaf scent. Other fig leaf blends do exist, such as Black Fig Leaf, so take some time to look around and find something that appeals to you. Lime fragrance oils range from sickly sweet to tart and tangy, so make sure you give them a sniff test so you know you're getting the one you want. You can choose whichever type of scent you like, but a slightly tart scent will blend nicely with the heavy fig leaf. Once you've found a blend that you like, make a tea light or votive candle and burn it to be sure that the oil blend translates into a nicely scented candle. Then you can move on to larger or fancier candles if you wish. A fig leaf and lime candle can really be any color you choose, but since it's a natural type fragrance, natural colors will enhance the overall effect. Try one or more of these suggestions for your candles. You could also consider layering any or all of these colors for a very pretty result. If you're considering giving these candles as gifts, a simple clear bag tied with raffia will continue the natural look. If you're curious as to what commercial fig leaf and lime products smell like, you can try one of the following products to compare your scent blend with. Zen for Men - The Zen for Men line of fig leaf and lime products consists of body lotions and moisturizing products, cleansers, soap, cologne, and reed diffusers. Fig Leaf Henri Bendel - This candle the Henri Bendel brand of fig leaf fragrance. Even if you can't exactly duplicate a commercial scent like fig leaf and lime, it can be fun to play around with scent blends. You may just stumble onto something you like even more! For candle makers who sell their products, this type of scent will give customers something they won't be able to find anywhere else.